Juan Nepomuceno María Bernabé del Corazón de Jesús Cordero de Hoyos (16 May 1824, Teziutlán - 29 May 1884, Coyoacán) was a Mexican painter and muralist in the Classical style, who began his career in Rome and Florence. 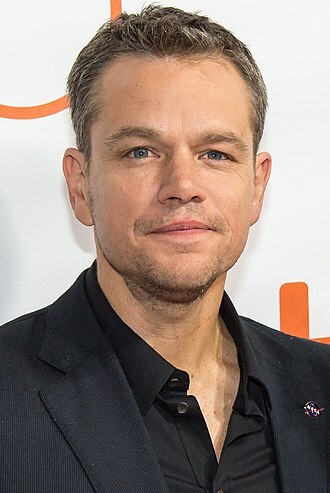 His parents originally expected him to join the family business, but eventually recognized his talent and enrolled him at the Academia de San Carlos. 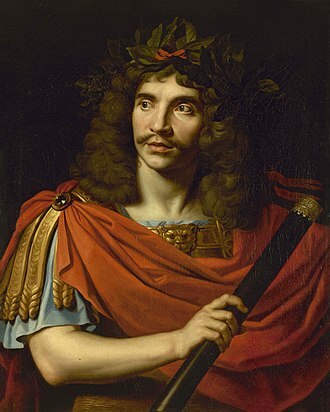 By 1844, he was so accomplished that his father gathered together as much money as he could (apparently even selling the family piano) and sent him to study in Rome at the Accademia di San Luca. His primary instructor there was the Spanish painter, Pelegrí Clavé, but he also came under the influence of the Nazarene movement and Filippo Agricola. Later, his works were noticed by former Mexican President Anastasio Bustamante, who was living in exile. Bustamante arranged for Cordero to be given a position with Mexico's legation at the Holy See, which allowed him to stay there until 1853. He returned home with several large canvases that he exhibited at the Academy, to great success. This created a rivalry with his former teacher, Clavé, who had moved to Mexico and was now the Academy's Director. Soon, the rivalry took on political overtones, as Cordero was a Liberal, while Clavé was a Conservative. 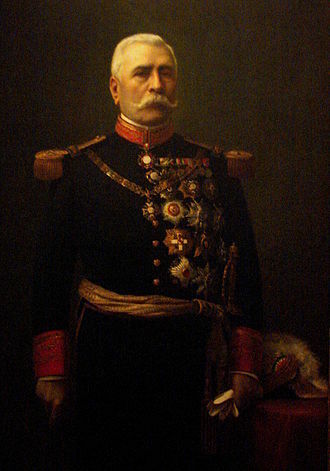 Cordero made an effort to supplant Clavé as Director, with the support of General Santa Anna, whose equestrian portrait he had recently painted, but the Academy's board chose to retain Clavé. From 1860 to 1867, he travelled throughout Mexico, painting portraits. He then turned to painting murals, including the cupola at the Church of Santa Teresa la Antigua, which had been destroyed by an earthquake in 1845 and rebuilt by the Spanish architect Lorenzo de la Hidalga [es]. He was also a friend of Gabino Barreda who, in 1874, asked him to paint a mural at the National Preparatory School, which would later become the home of the Mexican muralism movement. It was called "The Triumph of Science and Industry Over Ignorance and Sloth", and was the first Mexican mural on a secular philosophical theme. In 1900, it was destroyed by the school's Director, and replaced by a stained-glass window. Before its destruction, it was apparently copied by Juan de Mata Pacheco (1874-1956), but it is not certain that his painting of the same name is an accurate reproduction. After 1875, Cordero stopped exhibiting. This may have been a reaction to the political situation created by Porfirio Díaz' coup in 1876. 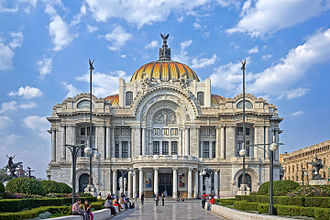 A major retrospective exhibition was held at the Palacio de Bellas Artes in 1945. ^ a b c d Brief biography @ Informador. ^ a b c d Vida y Obra de Juan Cordero @ Arte Visual Mexico. Juan Cordero y la Pintura Mexicana en el Siglo XIX, by Salvador Toscano. Universidad Autónoma de Nuevo León, 1946. Full text online. Wikimedia Commons has media related to Juan Cordero. Juan Cordero, Painter and Patriot by Steven Carr. Part of the article "Mexico’s Academy of San Carlos: How a School of Art Helped To Build a Nation" @ the Schiller Institute website. It contains obvious factual errors, but also has Pacheco's version of Cordero's mural. Anastasio Bustamante y Oseguera was president of Mexico three times, from 1830 to 1832, from 1837 to 1839 and from 1839 to 1841. He first came to power by leading a coup against president Vicente Guerrero, Bustamante was deposed twice and exiled to Europe each time. Anastasio Bustamantes father, José María, worked hauling snow from the volcanoes of Colima to Guadalajara, at 15, the younger Bustamante entered the Seminary of Guadalajara. When he finished, he went to Mexico City to study medicine and he passed his medical examinations and went to San Luis Potosí as director of San Juan de Dios Hospital. In 1808, he entered the army as a cavalry officer under the command of Félix María Calleja. In 1810, General Calleja mobilized the army to fight the rebels under Miguel Hidalgo, during the War of Independence, he rose to the rank of general. He supported royalist-turned-insurgent Agustín de Iturbide and the Plan of Iguala, on 19 March 1821, in support of Agustín de Iturbide, Bustamante proclaimed the independence of Mexico from Spain at Pantoja, Guanajuato. A few days later, he removed the remains of the 1811 insurgent leaders from the Alhóndiga de Granaditas in Guanajuato and had buried in San Sebastián cemetery. Iturbide named him commander of the cavalry, second in command of the Army of the Center, the Regency named him field marshal and captain general of the Provincias Internas de Oriente y Occidente, effective 28 September 1821. He fought and defeated a Spanish expeditionary force at Xichú, in December 1828, under the Plan de Perote, Congress named him vice-president of the Republic under President Vicente Guerrero. He took possession of this office on 1 April 1829 but soon was at odds with Guerrero, on 4 December 1829, in accord with the Plan de Jalapa, he rose against Guerrero, driving him from the capital. On 1 January 1830, he assumed the presidency on an interim basis, Congress declared Guerrero incapable of governing. In office, Bustamante removed employees not having the confidence of public opinion and he instituted a secret police force and took steps to suppress the press. It was headed by “the big three” painters, Diego Rivera, José Clemente Orozco and David Alfaro Siqueiros. The modern tradition has its roots in the 19th century, with use of political and social themes. The first Mexican mural painter to use philosophical themes in his work was Juan Cordero in the mid 19th century, the latter 19th century was dominated politically by the Porfirio Díaz regime. This government was the first to push for the development of the country, supporting the Academy of San Carlos. However, this left out indigenous culture and people, with the aim of making Mexico like Europe. Gerardo Murillo, known as Dr. Atl, is considered to be the first modern Mexican muralists with the idea that Mexican art should reflect Mexican life, Academy training and the government had only promoted imitations of European art. Atl and other early muralists pressured the Diaz government to allow them to paint on building walls to escape this formalism, Atl organized an independent exhibition of native Mexican artists promoting many indigenous and national themes along with color schemes that would appear in mural painting. The first modern Mexican mural, painted by Atl, was a series of female nudes using “Atlcolor” a substance Atl invented himself, very shortly before the beginning of the Mexican Revolution. Another influence on the artists of the late Porfirian period was the graphic work of José Guadalupe Posada. The Mexican Revolution itself was the culmination of political and social opposition to Porfirio Díaz policies, one important oppositional group was a small intellectual community that included Antonio Curo, Alfonso Reyes and José Vasconcelos. These ideas gained power as a result of the Mexican Revolution, there was nearly a decade of fighting among the various factions vying for power. Governments changed frequently with a number of assassinations, including that of Francisco I and it ended in the early 1920s with one-party rule in the hands of the Álvaro Obregón faction, which became the Partido Revolucionario Institucional. During the Revolution, Atl supported the Carranza faction and promoted the work of Rivera and Siqueiros, through the war and until 1921, Atl continued to paint murals among other activities including teaching the Mexico’s next generation of artists and muralists. Santa Teresa la Antigua is a former convent located in the historic center of Mexico City on Licenciado Primo de Verdad #6 just northeast of the citys main plaza. The complex ceased to be a convent in the part of the 19th century and has housed the Santa Teresa la Antigua Alternative Art Center since 1989. The impetus behind the establishment of the convent occurred in 1613 when the ship carrying archbishop Juan Pérez de la Serna ran into a storm threatened to destroy it. The archbishop promised Saint Teresa of Ávila to establish a Carmelite monastery if she would allow him to reach New Spain safely. Once securely on land, he convinced sisters Inés Castillet and Mariana de la Encarnación, heiresses of the plantations of Juan Luis de Riveral, the convent had a number of other wealthy contributors, such as the Marquise of Guadalcazar. Much of the convent was built in eight months, and the order was established in 1616, it was first known as the San José de las Carmelitas Descalzas convent. However, popularly the complex known as “Santa Teresa la Antigua. ”Much of the facility was built with the intention of allowing public access. The order was a one, as it followed the Spanish Discalced Carmelites tradition of writer. Unlike many other convents of the time, it had no servants or other help other than girls aspiring to be admitted into the order. The convent’s church was rebuilt in 1684 by Captain Esteban de Molina and was renamed officially as “Nuestra Señora de la Antigua. ”Much of the complex was rebuilt by Antonio Gonzalez Velazquez, paintings by the Spanish artist Rafael Ximeno y Planes were added at this time. 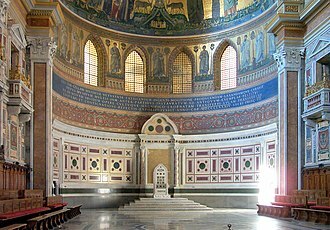 An earthquake demolished the dome and the apse, taking them the paintings done by Ximeno. Reconstruction, replacing the dome with a double-vaulted one, took thirteen years. New paintings were done by Juan Cordero, sor Juana Inés de la Cruz once lived here, but due to her fragile health and the austere conditions of the order, she soon moved to another convent nearby in the city. The convent served as a prison for Josefa Ortiz de Dominguez, in 1863, the convent was closed and the complex was converted to secular use. The Academy of San Carlos is located at 22 Academia Street in just northeast of the main plaza of Mexico City. It was the first major art academy and the first art museum in the Americas and it was founded in 1781 as the School of Engraving and moved to the Academia Street location about 10 years later. 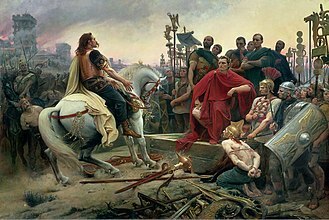 It emphasized classical European training until the early 20th century, when it shifted to a modern perspective. At this time, it integrated with the National Autonomous University of Mexico, eventually becoming the Faculty of Arts and Design. Currently, only graduate courses of the school are given in the original academy building. The Academy of San Carlos was founded in 1781 under the name of the School of Engraving, the School of Engraving was begun in the building that used to be the mint, and would become the modern-day National Museum of Cultures. Ten years later, it moved to the former Amor de Dios Hospital, the street it is located on was renamed from Amor de Dios Street to Academia Street in its honor. The Academy was originally sponsored by the Spanish Crown and a number of private patrons, the academy was inaugurated on 4 November 1781 on the saints day of King Carlos III, operating for its first ten years in the old mint building. However, it did not obtain its royal seal until 1783 and was not fully functional until 1785, the school moved into the old Hospital del Amor de Dios building in 1791, where it has remained ever since. The academy was the first major art institution in the Americas, Tolsá and Ximeno would stay on to become directors of the school. 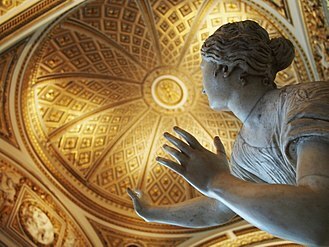 The new school began to promote Neoclassicism, focusing on Greek and Roman art and architecture, to this end, plaster casts of classic Greek and Roman statues were brought to Mexico from Europe for students to study. Since its founding, it attracted the countrys best artists, and was a force behind the abandonment of the Baroque style in Mexico, in the early 19th century, the academy was closed for a short time due to the Mexican War of Independence. 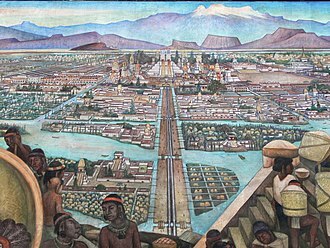 Mural by Diego Rivera showing the pre-Columbian Aztec city of Tenochtitlán. In the Palacio Nacional in Mexico City. 1903 broadsheet by José Guadalupe Posada. María Petrona Mori Cortés, mother of Porfirio Díaz, in a photograph made around 1854 in Oaxaca. Colonel Porfirio Díaz, 1861. At this time, Díaz was a Federal Deputy and had participated in two wars, namely the Revolution of Ayutla (1854–55) and the War of the Reform (1857–1861). La nueva democracia (The New Democracy), 1945, Siqueiros. El hombre controlador del universo (Man at the Crossroads), 1934, Rivera. The Civil Academy, one of the five institutions that joined efforts to create the University of Nuevo León in 1933. Lucas Alamán, founder of the Mexican Conservative Party. 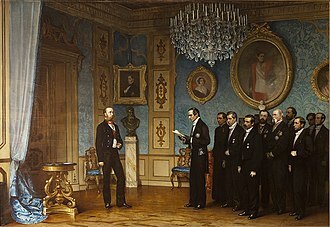 Maximilian receiving a Mexican delegation at Miramar Castle in Trieste, Italy. Festival of the Virgin of Carmen in the Zocalo, 21 July 2009. Former legation of Iran at the time of the Qajar dynasty in Washington, D.C.